Electrophoresis is a technique used to separate charged particles by moving them down a gel through an electric field. For a western blot, Sodium Dodecyl Sulfate Polyacrylamide Gel Electrophoresis (SDS-PAGE) is typically used. SDS is an anionic (negatively charged) detergent that will denature proteins from their folded state into polypeptide chains. The amount of SDS that binds a polypeptide chain is related to its mass i.e. a larger protein will bind more SDS and become more negatively charged. 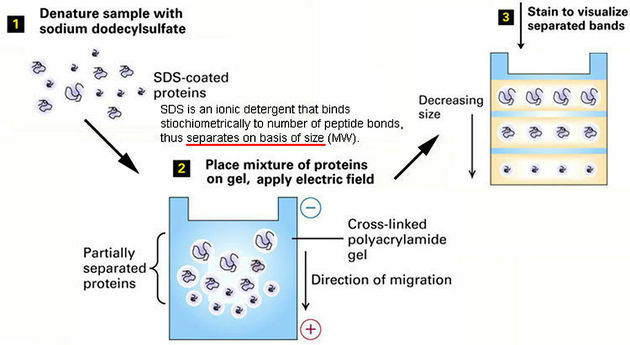 When SDS bound proteins are put in an electric field on a polyacrylamide gel for electrophoresis, proteins will separate down the gel according to charge (size). After electrophoresis, the proteins on the gel are transferred to a membrane to perform detection methods. 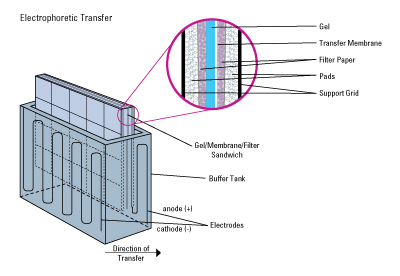 There are many different methods to transfer from gel to protein, but the most common method uses an electric field. The gel is placed on its side and sandwiched between the membrane and supports. An electric field is then passed so that the SDS bound proteins migrate towards the membrane. 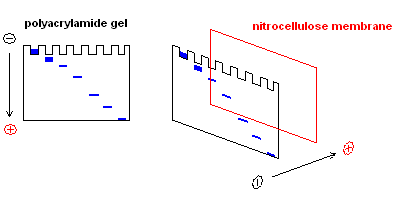 Nitrocellulose membranes have a high affinity for proteins and like to tightly bind proteins. Once the pattern of proteins migrates from the gel to the membrane they remain tightly bound in those positions. At this point the membrane has a pattern of proteins bound separated by size, we now need to find the protein of interest on the membrane to either see if it's there or determine how much of it is there. Now we are going to use the specificity of antibody-antigen binding to find the protein of interest. First, we need to 'block' the membrane. Blocking refers to blocking nonspecific antibody binding to reduce background noise in detection. To block, milk, serum, or other store bought buffers can be used to prevent antibodies from binding to the membrane or other nonspecific sites. Next, a primary antibody is applied to the entire membrane. The antibody is very specific and should only bind to its specific antigen (protein of interest). Now either a direct or indirect method is used to detect the protein. For direct detection, a primary antibody would be conjugated (linked) to an enzyme or fluorophore. When using enzyme detection, the typically chromogenic enzyme is used. When a substrate is added the chromogenic enzyme converts the substrate into a product that produces color. If a spot of color appears on the membrane, that is the protein of interest (qualitative detection). If there is no spot the protein isn't there, or there is too little to detect. Another method uses fluorophores. Fluorophores are molecules that once excited by light emit light of a different wavelength. When a laser is shined, the fluorophore will produce a luminescent product. The amount of light can be measured and is assumed to correlate with the amount of protein (semi-quantitative detection). The advantage of using fluorophores is that multiple wavelengths of light can be detected, so multiple proteins can be distinguished and detected at once. Typically indirect detection is used because conjugated primary antibodies are very expensive and the addition of enzymes or fluorophores to primary antibodies has the potential to interfere with binding. 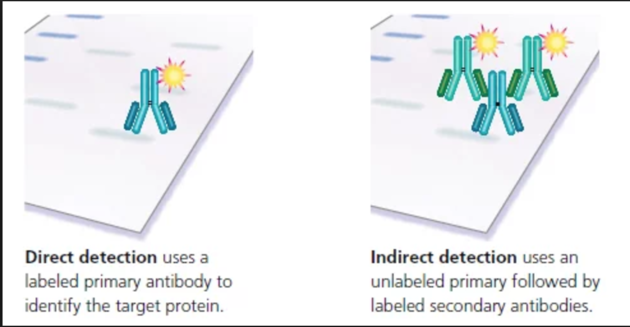 Indirect detection involves using primary and conjugated secondary antibodies. Suppose you are looking for a specific protein in a sample from a human. You use a primary antibody for protein A raised in a mouse (typically written mouse anti-A primary antibody). The signal can be amplified by adding a conjugated secondary antibody raised in another animal. For example, a donkey anti-mouse secondary antibody can bind any primary antibody raised in the mouse, and multiple secondary antibodies can bind one primary, thus amplifying the signal. The same ideas apply for using an enzyme or fluorophore as described in above in direct detection, but now there will be a higher signal. MLA (Modern Language Association) "The Western Blot." ScienceAid, scienceaid.net/Western_Blot Accessed 20 Apr 2019. Chicago / Turabian ScienceAid.net. "The Western Blot." Accessed Apr 20, 2019. https://scienceaid.net/Western_Blot.